I want to get back into drawing, the pencil in my hand, the thick charcoal under my nails. I keep collecting spare pieces of paper, of cardboard, in the hope that something might happen. A horse, gray and white shadows, it appears—the long mane draped over one shoulder like a flag, the exposed eye and eyelashes that are so difficult to render. 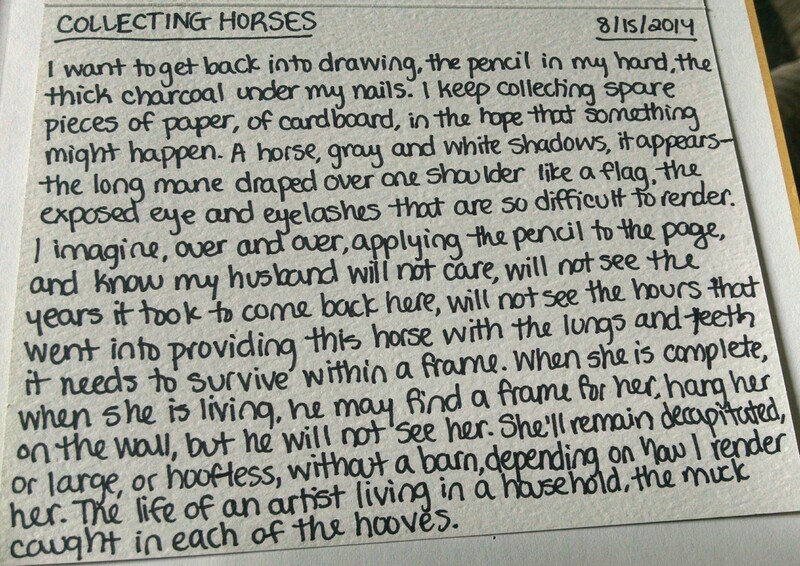 I imagine, over and over, applying the pencil to the page, and know my husband will not care, will not see the years it took to come back here, will not see the hours that went into providing this horse with the lungs and teeth it needs to survive within a frame. When she is complete, when she is living, he may find a frame for her, hang her on the wall, but he will not see her. 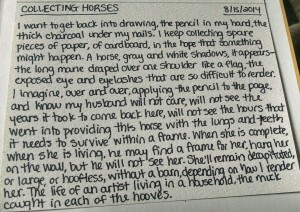 She’ll remain decapitated, or large, or hoof-less, without a barn, depending on how I render her. The life of an artist living in a household, the muck caught in each of the hooves.